Davis Taylor is founder and leader of TAI Incorporated. He has over twenty-five years experience in organizations ranging from a high-tech start-up company to Fortune 50 corporations, where he provided vision and leadership to drive growth in challenging business environments, start-up ventures and turn-around situations. His contributions in six different industries provided real-world, practical experience and a proving ground to demonstrate the effectiveness of values-based leadership, with tangible results. Prior to TAI Incorporated, Davis served as Vice President, Field Operations for Suburban Partners, a $750 million energy services company. Previously, recruited by Investment Bankers to salvage a failing start-up business, he was Chief Executive Officer for Elcom Technologies. Before Elcom, Davis served as Vice President, Business Development at Lenox, Inc., with operating responsibility for six profit centers, including specialty corporate and international markets. Davis’ earlier professional experience includes national accounts, sales management, process improvement and operational roles at Pepsi Cola and Baxter International. Davis served four years as a U.S. Army Officer and is a graduate of The Citadel, The Military College of South Carolina. 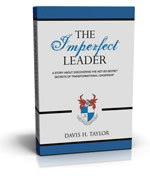 He is available for seminars, leadership retreats and other speaking engagements on the content in The Imperfect Leader. If you are interested in having him speak at your event, please contact us. Learn more about TAI Incorporated at www.taiinc.com. "Much has been written about mission and values, but the concept of behavioral norms, so adeptly developed in The Imperfect Leader, takes mission and values from the theoretical to the practical for a management team. Also, the humility theme that resonates throughout this book is the critical missing ingredient for so many leaders. I heartily recommend this book for all leaders and aspiring leaders."